I must admit I’m somewhat embarrassed by my weaknesses. I’d prefer to hide them, ignore them, deny them. I don’t understand how weaknesses could possibly be a means of strength. The way I see it, when I am weak, then I am…weak. It was all starting to come together! I could now see how Paul was able to “glory” in his weaknesses: Because they revealed GOD’s glory! God comes and dwells right there. His grace meets us in our places of weakness, embarrassment, and struggle. We can rest in the Power that rests on us. Rather than minimizing Paul’s effectiveness in ministry, his weaknesses were paradoxically the very things magnifying the “Shechinah” glory of God in and through him! 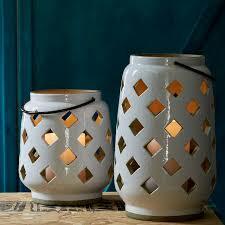 This summer these ceramic lanterns kept catching my eye. I’d notice them on TV or in the Home and Garden section of a store. They are rather plain and ordinary, but quite stunning when they’re all lit up. The openings are where the light gets out. We are like these lanterns. We’re nothing fancy, but we have the light of Christ in us. Our weaknesses are the holes, the cracks that let the Glory out! We can say, “Yes, Lord.” Yes to weaknesses, challenges, and difficulties. Yes to gaps, flaws, and cracks. Yes to plain and ordinary. If they invite Your grace, if they reveal Your strength, if they manifest Your glory, then we too can delight in saying YES! YES! I am weak, but HE is strong! Lord, let YOUR glory shine! This is so great! I’ve never totally understood this, but your words are so helpful.. the lanterns are especially helpful, being such a visual person. I love to think of God’s strength shining through my weakness. Rather comforting:-) Thank you.